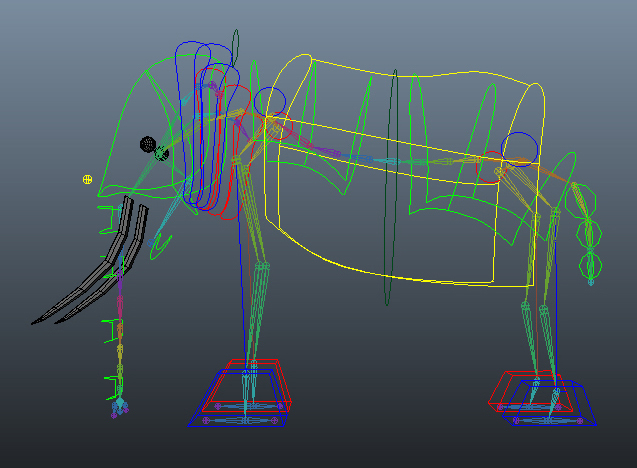 With my scenes set up for my animators on the elephant project, I can finally get to work on my side project; the toony rig. 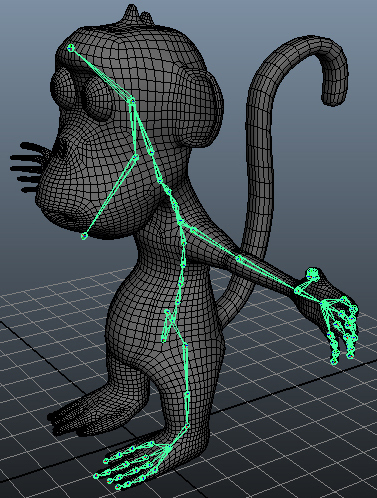 The first step to rigging anything is to build the joints that will drive the deformation of the mesh. 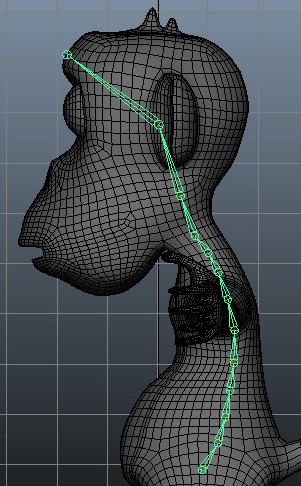 I call this the deform skeleton. The first thing I create is always the spine. 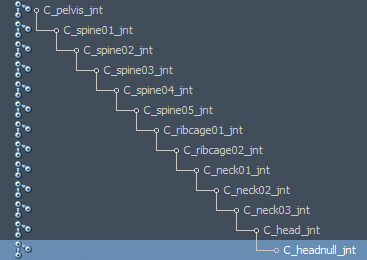 The pelvis is the start of the chain and the head the end. 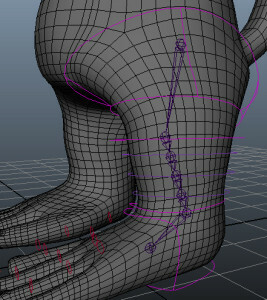 I generally name joints as I go to avoid confusion when the entire skeleton has been built. 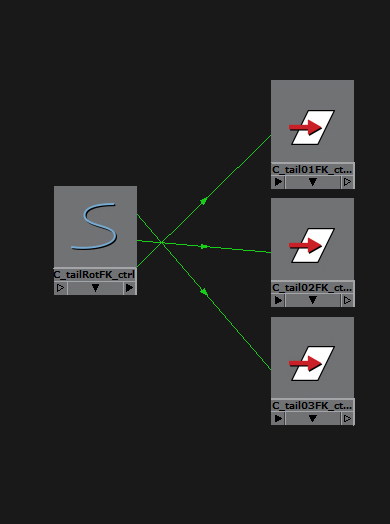 I used the same naming convention as my elephant rig. A prefix of C_, L_ or R_, the name of the joint and a suffix of _jnt. The arm was the next thing I built. 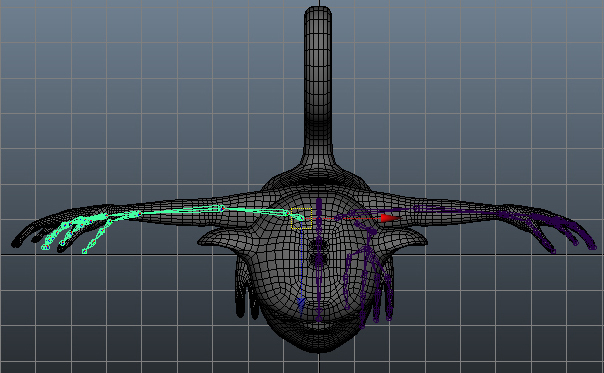 I initially place the bones using the orthographic front view. 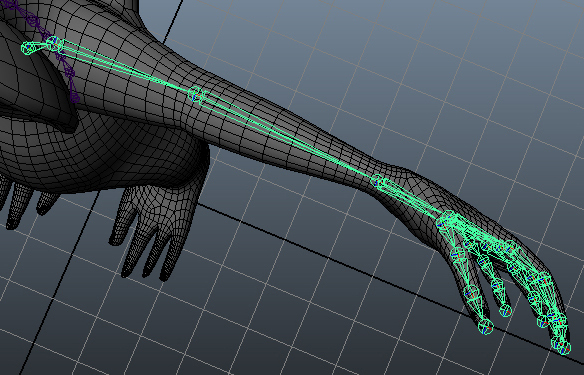 I line up the joint positions to the hand as well as possible. However, because my view is orthographic, the joints are all created on a flat plane. This does not match the shape of the hand, so I then use the perspective view to line everything up correctly. 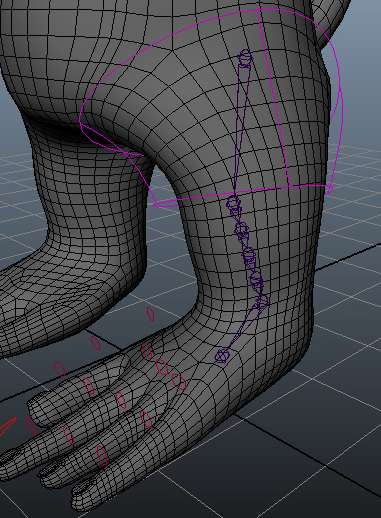 I then repeat the process with the foot, but this time I create the joints from the orthographic side view. To ensure my joints orient correctly later on, I make sure that the first finger or toe I create is the most central one. This simply means that the joint in the palm or sole of the foot will point to this finger when oriented, instead of out to one side at, for example, the thumb or little toe. 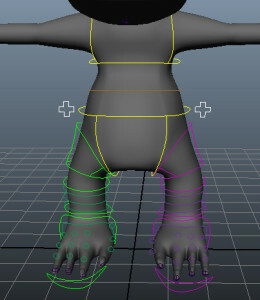 With all the joints created on one side of the body, I now need to correctly orient the joints. 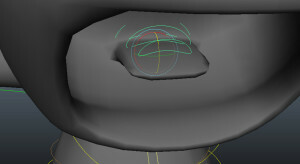 This is good practice because it ensures the joints will all rotate nicely in the same axis. These two images show the spine axes before and after the orientation. 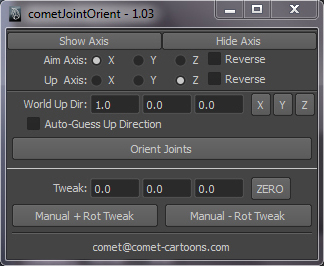 I use comet tools to do the joint orientation. 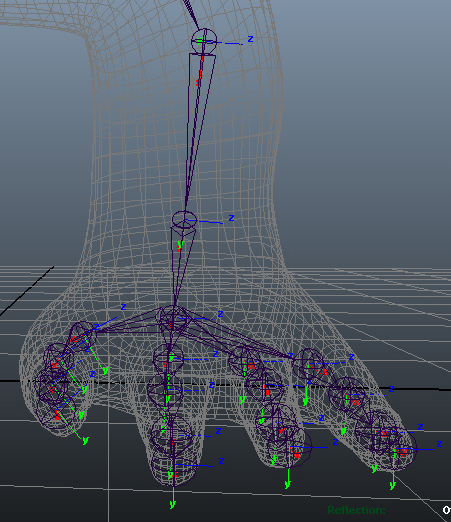 After orienting the joints on the hands and foot, I tweaked the angles of the thumb. The reason for this is so that if all the finger joints are selected and rotated in one axis, they should close to form a fist. This makes it much easier for the animator to work and keeps the animation curves much cleaner. With the orientations tidied I could finally mirror my arms and legs so that I had a complete skeleton. 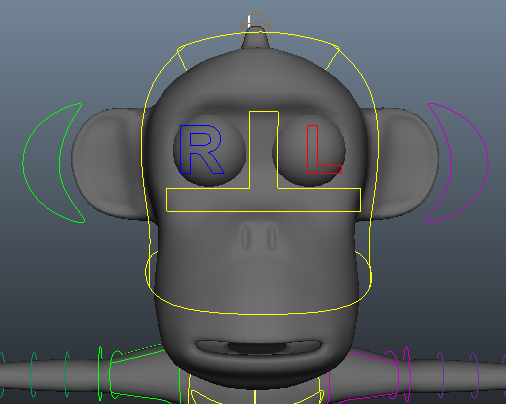 Unfortunately, once I had mirrored the joints, it was clear that the mesh had not been mirrored correctly and was not symmetrical. I have contacted the artist and asked if they can have a look and fix it. 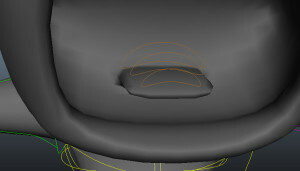 However, since it is the easter holidays, I have no idea when they will see my email, let alone send me the fixed mesh. I dont want to continue rigging, just in case there is a problem and they are unable to get things symmetrical for me, as that would mean rebuilding the joints for the right arm/leg seperately and I would have to redo any work I had already done. 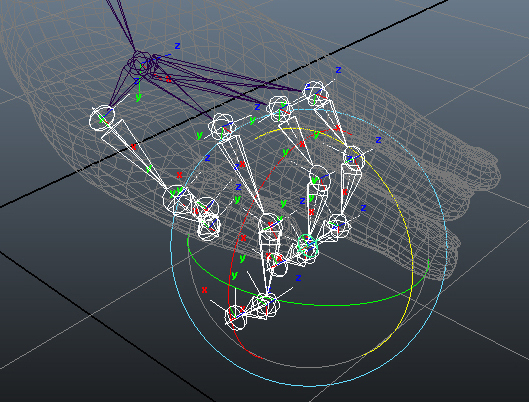 I think the camera tracking has been one of my biggest worries during this project. It is something I have only fleeting experience with, but it is essential for producing a polished end product. When filming any moving camera shots we decided to keep them on a tripod and just pan to keep things simpler. The first shot I chose to track was probably one of the most important shots in the entire project: the very final shot where the elephant gives the monkey back to the mother. 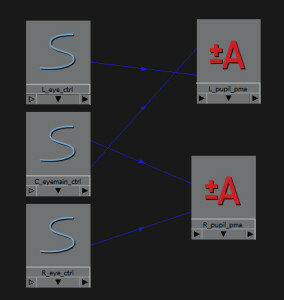 I have been using Boujou as this was the program we were introduced to during a previous compositing project earlier in the year. It had produced a great result for me in the past, but I was aware that others on my course were not so fortunate. Boujou does not always get it right first time. 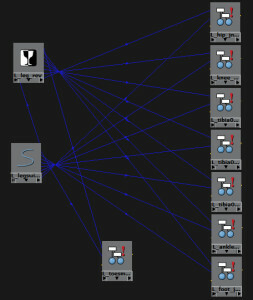 I imported the footage and set Boujou to tracking the movement in the image. To do this, Boujou latches onto distinctive areas in the image (ie colour changes which suggest edges of objects). 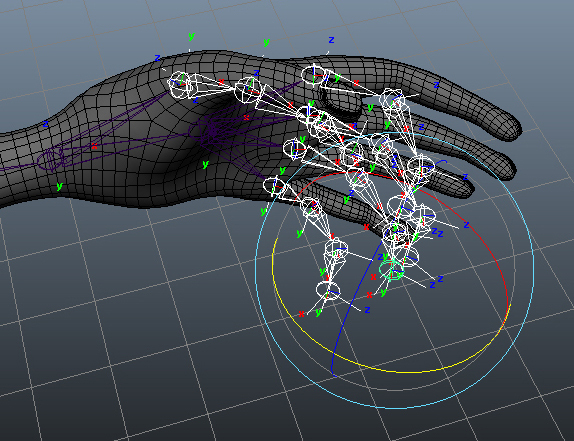 It then tracks how these points move throughout the footage. 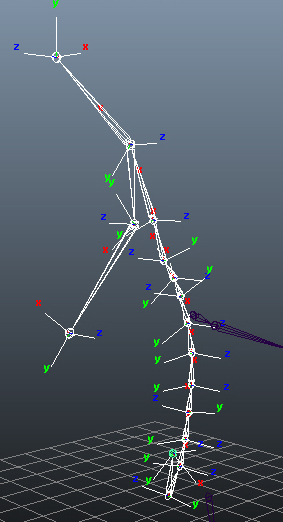 To get the best result, it is generally necessary to have points that occur on the x, y and z axis within the 3d space of the shot. However the shot I was working with had a flat wall in the background (which meant no track points in the z axis) and I worried that Boujou would struggle to know how close or far away the camera was throughout the shot. 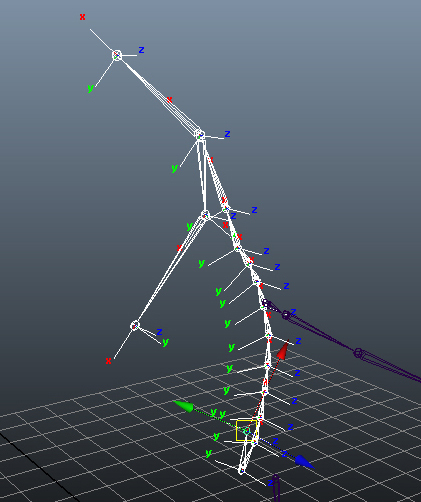 The next stage of the camera tracking was to ask Boujou to use these track points and their movement to create a camera in 3d space that matches the movement of the camera in the shot. Thankfully I found an option at this point to tell Boujou that the camera was nodal. This means Boujou knew that the camera was on a tripod and in a fixed position and could only rotate. 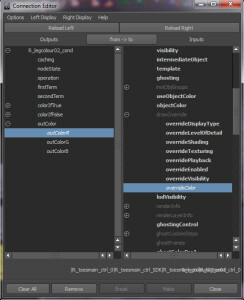 Finally, I could export the information into Maya and check to see whether it worked. To my delight, the tracking seemed great. However, I quickly noticed that objects in the scene seemed to suddenly move up and down, or side to side out of time with the footage. Since I have no knowledge of how to correct this in Boujou I decided to see if I could fix it without too much effort in Maya. I played the animation until I found a moment when objects in the scene moved out of sync with the footage. 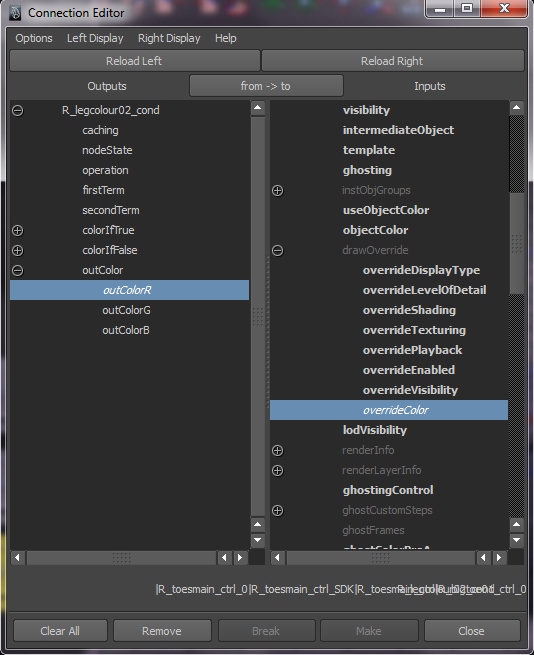 I then checked the camera’s curves in the graph editor to check if there were any odd kinks or jumps. Most of the problems were extremely easy to find and fix, but there was one that was extremely frustrating. About two thirds of the way through the scene skipped sideways suddenly and then gently eased back into its original position. I could find nothing on any of the curves that would indicate the camera was rotating like this. 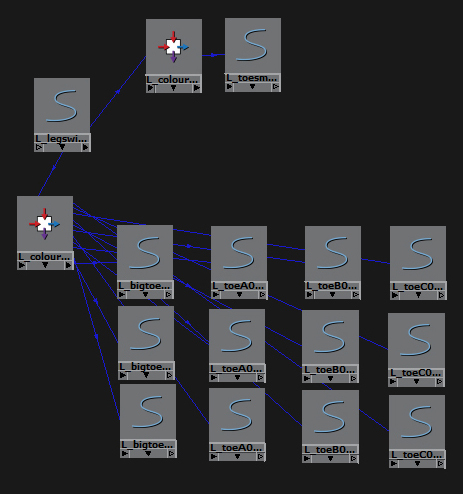 I spent a long time trying to establish whether it was just one curve or all of them effecting it, but eventually, after some painstaking work tweaking each individual key, I managed to tidy it up so that the movement was barely noticeable. I wanted to set up the scenes that my animators would be using before I did anything else, so I then moved on to some of the scenes with a fixed camera. 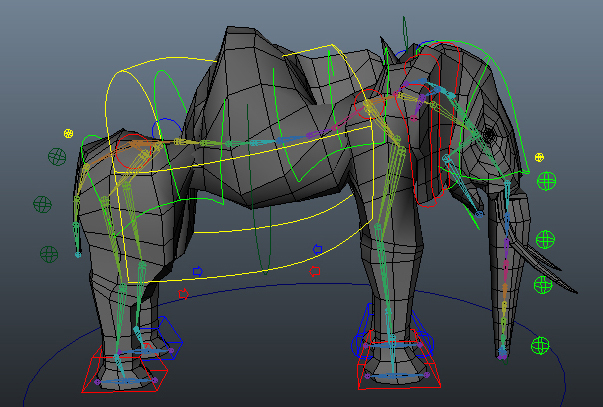 I created a new Maya file for each one, referenced the elephant rig and created a new camera. I created an image plane for the camera with the .png sequence of the correct shot. I cannot believe how difficult it was to then actually manage to position the camera in 3d space so that it lined up with the footage. I had foolishly assumed that it would be the moving camera shots that would cause me the issues when all along it was positioning cameras by hand that would be my downfall. 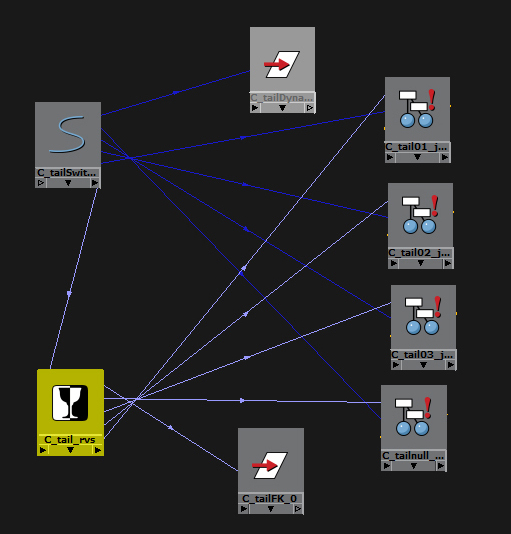 The situation was made more frustrating by the knowledge that I had assumed Motion Graphics were taught easy ways to work out the position of cameras in still shots. In 2nd year, we learnt to take a photo with the camera in the same position and an item in the shot that you knew the dimensions of. You could then use this item to help line up the camera. Since I was relying on the knowledge of my Motion Graphics students as I knew they had plenty more experience than me, I readily accepted their answer when they assured me nothing was needed for these shots. It was pretty galling when I asked them later on how I would be positioning the cameras and they answered “by eye”. I have at least learnt one lesson from this. Whenever possible, if filming for a VFX composition with a still camera, make sure there is something in shot that you know the exact dimensions of. It will make your life so much easier.